We bought some peaches on the way home from the Andy Warhol exhibition last weekend, and they felt just about ripe enough today. But instead of eating these juicy peaches raw, I thought could try a frangipane flan, similar to one K&M made for us a couple of Saturdays ago. I couldn’t find a frangipane recipe in any of my many cookbooks, so checked out BBC’s food pages. I don’t usually rely on Ready Steady Cook baking recipes, as they’re not as precise enough to be repeatable, but I thought I’d just give this a try ‘cos I wasn’t planning on making the frangipane hold any weight. 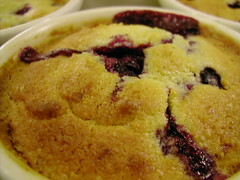 I tripled the recipe, but had quite a bit left over, so mixed up the leftover with a handful of our blackcurrant crop from last year and baked that in ramekins. My rigged recipe for just enough frangipane for a 9″ flan dish follows. Roll out the shortcrust pastry onto a flan dish and press into the sides. Cut off excess pastry. Cut a circle of baking parchment (I use some pre-cut silicone circles from Lakeland Limited), and pour in some dried beans (like adukis or peas). Bake blind for 15 min in a 180 degC oven. Allow the pastry to cool a little, remove the beans and circle, prick the bottom of the pastry and bake for another 10-15 min. While the pastry is baking, make up the frangipane. Cream the butter and sugar. Then add the ground almonds and flour in small batches. Stir well, then beat in the eggs, one at a time. Spread the frangipane on the pastry, then embed the halved peaches, round side down, in the frangipane. The blackcurrant frangipane was a bit on the tart side, and could probably have done with a touch more sugar. What pigs we are… We now have a whole peach flan and 2 other ramekins to scoff. What are the chances of finishing them off by the end of the weekend? 08 May ’05 edit: The peach flan has a bit too much frangipane, and not enough peach. Probably best to smear a centimetre or two, rather than the four or five that I used in the flan. I’d also squeeze another peach on somehow next time. Technorati tags: flan, frangipane, peach, recipe.